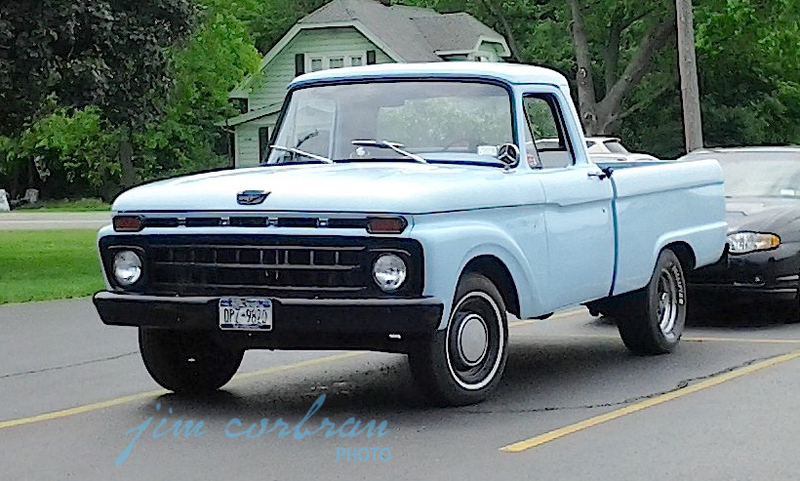 Researching this 1965 Ford F100 I came across the French-Canadian brochure for Ford’s ’65 Ford and Mercury pickups… and learned this: Vous avez le choix entre la practique caisse “Flareside” ou la large caisse “Styleside” avec de robusres doubles parois terminées par l’abattant que l’on actionne d’une seule main. Which Google tells me translates to: You have the choice between the practical "Flareside" box or the "Styleside" wide box with double wall panels terminated by the flap that is operated with one hand. I assume the “terminating flap” refers to the tailgate latch. My high school French teacher might not approve of this translation — come to think of it, he didn’t approve of too many of my translations, either, Lol! Saw this blue example a while back in Sanborn.